This pie is about as spring as you can get in one dessert! The fresh strawberries compliment the lemon cream perfectly and it’s not heavy, which is nice now that the weather is starting to warm up a bit. Additional bonuses: it looks gorgeous and you can assemble it all in advance! This recipe makes two pie crusts. You’ll only need one for this recipe, so stick the other in the freezer and defrost overnight in the refrigerator the nigh before you want to use it. In a small bowl, add the salt to the water and stir to dissolve. Put the flour in the bowl of a food processor. Sprinkle the butter on top. Pulse briefly. Add the water. Pulse again. The dough will just begin to come together. Pour the dough onto a lightly floured counter. Divide into two balls. Press into 1 inch thick disks. Wrap in plastic wrap and refrigerate for 2 hours or overnight. Roll out the dough until it is 1/8 inch thick. Lay into a pie or tart dish. Line with parchment and fill with pie weights, beans or rice (new discovery on the rice – works just fine). Chill the shell for another 30 minutes to get the flakiest crust. Heat an oven to 375 degrees. Bake for 25 minutes. Remove the weight and parchment and bake for another 5 minutes. Cool completely. Over a double boiler, whisk the eggs, sugar, salt, lemon zest and juice together. Continue stirring until a custard has formed. Be very diligent with this step. You can very easily end up with lemon scrambled eggs! No good! Once the mixture has thickened, take it off the heat and whisk in the butter. Strain though a mesh sieve and chill. Ta-da! Lemon curd! Slice the strawberries. Whip the cream with the sugar. Lighten the lemon curd with the whipped cream by first stirring in 1/3 of the whipped cream and then folding in the remaining. Carefully! I always am too hasty here and Jordan has to remind me to slow down. Pour the lemon filling into the prepared crust. Top with sliced strawberries. Refrigerate until ready to serve. This pie is delicious and the lemon cream would compliment any berry as each comes into season. The combination of the lemon and the strawberry is particularly satisfying because it hit a nostalgic vein in all of those eating it … Jordan, Matt, Alexa and I were eating our dessert on Sunday evening when Jordan pauses, “Does this remind anyone of some sort of ice cream novelty?” Instantly, and almost in unison, the rest of us cried, “Flintstones Push Up pops!” Yep. The pie tastes like a Push Up. Not sure how it happened, but it is absolutely going to happen again. … and the first strawberries of the season!!! I am so excited for the next few months of amazing spring and summer produce! Aren’t they absolutely adorable! Don’t you just want to eat tons and tons of them! And one other note: Our apologies for the lack of posts lately. We’re working on a few new projects and they’ve been consuming our culinary energy. Once the results are in, we will have some awesome insight for you guys! Spring love to all of you! Tuesday we celebrated our first passover seder. Our neighbor Robin moved far away from her family on the East Coast and so she didn’t have any real Jews to celebrate with. We decided to do our best to fake it and turn out an awesome Passover Seder anyway. Under Robin’s tutelage, we did. Our Passover Seder was awesome – great food, great friends, a great time! Here are some photos I took during the dinner. The chickens before I roasted them. The light was so pretty, I couldn’t resist. Our view during dinner. Seriously, what a beautiful city! Robin’s matzoh ball soup – carefully crafted from her mother’s recipe. Robin’s pup Honey also had an awesome time at the seder. A tower of matzo – the perfect vehicle for salted butter! And you all know how much I love butter! The spread – roasted chicken, roasted vegetables, matzoh kugle, risotto with leeks and wild mushrooms (not kosher for Passover, but absolutely delicious! ), salad with beets and oranges, and matzo! The answer is always pork … except when it’s butter … or when it’s the topic of today’s post: duck fat! I’ve been wanting to experiment with duck for quite some time, so I rode down to the Fatted Calf, picked up 2 duck legs and got to work. I began by scoring the fat in a cross-hatched pattern so that it can render out. I then seasoned the duck with salt, let it rest, and prepared mirepoix (half an onion, a carrot, and a stalk of celery, all finely diced). Once everything was ready, I got to rendering. Just put the duck skin side down in a skillet over low heat and you’ll see the lovely fat fill the pan. The picture above was after about 20 minutes and there was no fat in the pan when I started! After you’ve rendered off most of the fat and the skin starts to brown (about 3o-40 minutes), flip and repeat on the other side. Since there is much less fat on the other side, it will render much more quickly (maybe 5-10 minutes). Remove the fat from the pan and save it; don’t throw it away! Increase the heat to get good browning on both sides of the duck. Remove the duck, lower the heat to medium, add the mirepoix, and cook until the onion is translucent (2-3 minutes). Deglaze with about half a cup of wine, add a cup of broth, and bring to a simmer. Put the duck back in the pan, cover, and place in a 300 degree oven for 2.5-3 hours. I also added a sprig of rosemary, some fresh oregano, and a couple cloves of garlic for good measure. Once the duck is tender, remove it from the oven, set aside and keep warm. You can make a sauce from the braising liquid if you’d like. When you’re ready to serve, just throw those legs under the broiler skin side up until it’s brown and crispy. This was delicious and a simple sauce made from the braising liquid added some nice flavor. I just took out the herbs and then blended, strained, slightly reduced it, and adjusted the flavors in accordance my current mood. This dish was also quite easy because you leave it alone most of the time; while the duck was rendering I was in the kitchen reading for school, and the rest of the time I simply ignored it all together. One final thought: the same rendering technique can be used for duck breasts as well if you feel like being fancy, just render the skin side nice and slow until it’s brown, then sear the other side over high heat until medium-rare. Everyone likes fried chicken, but actually frying said chicken is a big pain. With this recipe you end up with the perfect crunchy-crisp exterior and juicy chicken interior, but don’t have to deal with vats of oil. We were actually blown away by how well this chicken turned out and how easy it was to prepare. Even after a few cocktails, the recipe when off without a hitch! Salt and pepper the chicken. Marinate it in the buttermilk and paprika for a few hours. Marinating the chicken in buttermilk is key and makes a huge difference in the moistness and flavor. Preheat an oven to 350 degrees and line a baking sheet with parchment paper. Strain the chicken from the buttermilk, dunk each piece in egg and coat in panko. Put on the baking sheet. Bake for about 15 – 20 minutes, until the chicken is firm to the touch. If your chicken isn’t browned, throw it under the broiler for a minute or two. The only update we’d make to this recipe the next time we prepare it is to mix the panko with a little melted butter to give the crust just a bit more flavor and color. We served this chicken with some beautiful artichokes, but I imagine it would go great with cole slaw or mac and cheese! Even after making the linguini with ricotta dish earlier in the week and eating it for lunch the next day with extra ricotta, we still had quite a bit of cheese left over. With the leftovers, I wanted to make a recipe that would respect the effort I’d put into making the cheese from scratch and not overpower its milky flavor. Well, the King Arthur Bread Flour Company was on my side! Their weekly email featured a recipe for a chocolate cake with a ricotta filling based on a traditional Italian Easter dessert; I drew inspiration from that recipe for this cake. I used the same Ina Garten recipe that I used for Jordan’s birthday. The secret ingredient in this cake is 1 cup of fresh coffee, which intensifies the chocolate flavor and makes a very moist cake. Preheat the oven to 350 degrees. Butter and flour two 8 inch round pans. Sift the dry ingredients into the bowl of a mixer fitted with the paddle attachment. Stir to combine. Combine wet ingredients in another bowl. With the mixer on low, slowly add the wet ingredients to the dry. Add the coffee. Pour into prepared pans and bake for 35 – 40 minutes. Cool before frosting. Mix the cheese, sugar and vanilla until combined. Once the cakes have cooled, spread a thick layer of cheese between the layers and serve. After serving, refrigerate any leftover cake well-wrapped in plastic wrap. I made these chocolate sandwiches for dessert on girls’ night. They are absolutely delicious and super easy to make. Imagine a french toast-pain au chocolat hybrid. We served them with fresh strawberries because it’s spring! Whisk together the egg, milk and vanilla. Dunk the bread in the egg mixture. Make sandwiches with the bread and chocolate. Heat a nonstick pan over medium heat. Cook the sandwiches, 5 minutes per side, until golden brown and the chocolate has melted. Serve immediately. Like most dishes with few ingredients, the quality of the chocolate and bread really make this dessert. Use a chocolate you like to eat on its own. However, because you dunk the bread in the egg mixture, you could certainly use bread that is a few days old. Last week for girls’ night we inaugurated Robin’s grill – a pretty momentous occasion in the life a grill, at least from my experience. Robin had been talking about making a grill purchase for over a month and finally the weather was nice enough to merit it. 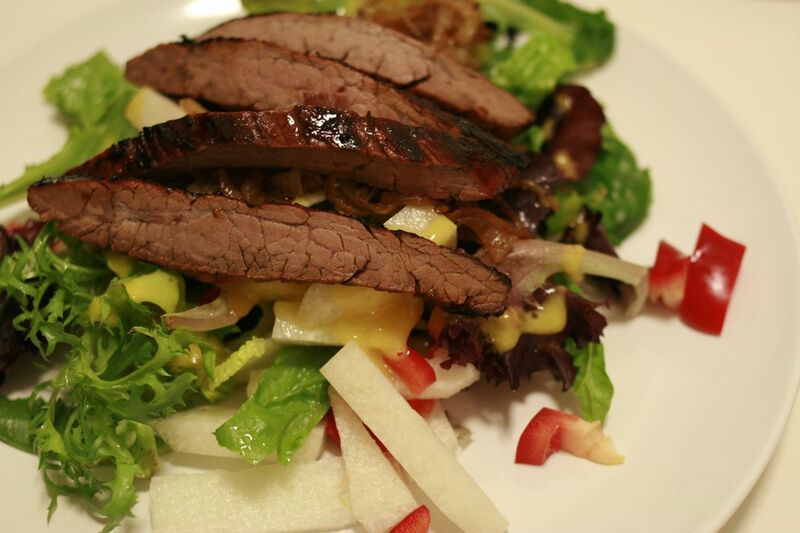 We decided to make a steak salad. Robin strong-armed grilling the meat and I made the salad and the dressing. Salt and pepper the steak. Marinate the steak for about 15 minutes in some balsamic vingar. Heat your brand spankin’ new grill to high. Cook the steak 8 – 10 minutes per side, or until the internal temperature is 130 degrees for medium rare. Rest for about 10 minutes and slice against the grain. Puree the mango in a food processor. Add the vinegars and mix. In a slow stream, add the oil until the dressing has emulsified. You may need less or more oil depending on your mango’s juiciness. Season with salt and pepper. Toss with salad just before serving. Top with the steak. While we overcooked our steak slightly, the grill’s maiden voyage was a success! (We need a bit more practice to master the grill’s temperature range). This salad is easy, quick and tasty. To be honest, I think I could skip the mango dressing. My mango was pretty mild and did not impart nearly enough tropical flavor into the dish for the amount of work it is to get the flesh off those suckers. Maybe if I knew how to pick a good mango, I’d try it again. I think next time we are going to make a strawberry-champange vinegar dressing! As we described a couple of months ago, Jordan and I joined a CSA (community supported agriculture) group. We’ve been enjoying our boxes of super seasonal and fresh produce and trying new recipes like linguini with leeks and fresh ricotta and strawberry lemonade sorbet. Our farm is Eatwell Farms and I want to share the beautiful produce we just picked up! This week we received: oregano, navel oranges, lemons, dandelion greens, chard, green garlic, leeks, pink lady apples, carrots, savoy cabbage, and sweet potatoes. If you are interested in joining a CSA, visit LocalHarvest.org to find one in your area. The first time that I can remember having tortilla soup was at Chili’s. Yes, the chain restaurant home to blue margaritas, hot wings and molten chocolate cake. It was called chicken enchilada soup and I thought it was good. When planning our meals on Sunday morning, I decided to improve upon my chicken enchilada soup memories. As it turns out, tortilla soup/chicken enchilada soup is pretty darn easy to make and my soup blew that one from Chili’s out of the water. Big surprise, right? Salt and pepper both sides of the chicken legs and thighs. In a dutch oven or heavy stock pot, saute the diced onion and garlic over medium heat in a little olive oil until it starts to become translucent. Push the onions to the sides of the pan and add the chicken. Brown each side of the meat. Add the vegetable stock, diced tomatoes and two chipotles. Let simmer for about 20 minutes, until the chicken has cooked through. Remove the chicken and set aside to cool. Remove the chipotles and discard. Puree the soup. You’re welcome to leave the chillis in the soup, but I found the broth was spicy enough without pureeing the chillis. Put the soup back on to simmer. Shred the chicken. About 10 minutes before serving, add the chicken and black beans to the soup. Serve with cilantro, sour cream, cheese, crumbled chips and green onion. We also enjoyed some roasted purple cauliflower. This soup was awesome and will become part of the permanent repertoire. I love all of these flavors. Jordan and I ate it for two days straight! The broth is spicy and tomatoey, but still creamy and viscous. Another bonus: the soup could easily be made vegetarian – just add an extra can of black beans.